One of the toughest problems in predictive model occurs when the classes have a severe imbalance. We spend an entire chapter on this subject itself. One consequence of this is that the performance is generally very biased against the class with the smallest frequencies. For example, if the data have a majority of samples belonging to the first class and very few in the second class, most predictive models will maximize accuracy by predicting everything to be the first class. As a result there's usually great sensitivity but poor specificity. There is almost a 9:1 imbalance in these data. The plot shows the default probability cut off value of 50%. The sensitivity and specificity values associated with this point indicate that performance is not that good when an actual call needs to be made on a sample. One of the most common ways to deal with this is to determine an alternate probability cut off using the ROC curve. But to do this well, another set of data (not the test set) is needed to set the cut off and the test set is used to validate it. We don't have a lot of data this is difficult since we will be spending some of our data just to get a single cut off value. Alternatively the model can be tuned, using resampling, to determine any model tuning parameters as well as an appropriate cut off for the probabilities. The latest update to the caret package allows users to define their own modeling and prediction components. This also gives us a huge amount of flexibility for creating your own models or doing some things that were originally intended by the package. This page shows a lot of the details for creating custom models. Suppose the model has one tuning parameter and we want to look at four candidate values for tuning. Suppose we also want to tune the probability cut off over 20 different thresholds. Now we have to look at 20×4=80 different models (and that is for each resample). One other feature that has been opened up his ability to use sequential parameters: these are tuning parameters that don't require a completely new model fit to produce predictions. 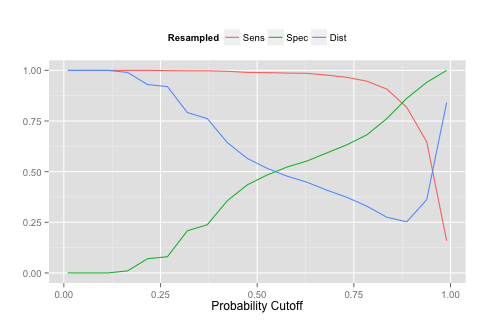 In this case, we can fit one random forest model and get it's predicted class probabilities and evaluate the candidate probability cutoffs using these same hold-out samples. Again, there's a lot of details on this page and, without going into them, our code for these analyses can be found here. Basically, we define a list of model components (such as the fitting code, the prediction code, etc.) and feed this into the train function instead of using a pre-listed model string (such as method = "rf"). For this model and these data, there was an 8% increase in training time to evaluate 20 additional values of the probability cut off. ## value of the probability threshold. ## The best possible model has sensitivity of 1 and specifity of 1. ## How far are we from that value? Dist was used to select the optimal model using  the smallest value. The final values used for the model were mtry = 3 and threshold = 0.887. You can see that as we increase the probability cut off for the first class it takes more and more evidence for a sample to be predicted as the first class. As a result the sensitivity goes down when the threshold becomes very large. The upside is that we can increase specificity in the same way. The blue curve shows the distance to the perfect model. The value of 0.887 was found to be optimal. 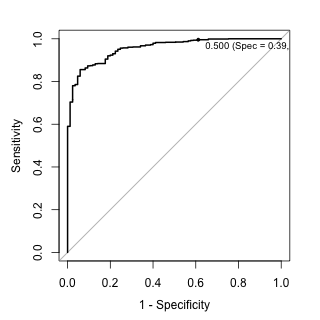 Now we can use the test set ROC curve to validate the cut off we chose by resampling. Here the cut off closest to the perfect model is 0.881. We were able to find a good probability cut off value without setting aside another set of data for tuning the cut off. However we should be careful because the probability values are not consistent with our usual notion of a 50-50 cut off. Tagged with R, Classification, Class Probabilities, Class Imbalance, Random Forests, ROC Curve. February 6, 2014 by Max Kuhn.